New phosphorus nutrition tools available online! Last year the Department of Agriculture and Fisheries beef extension team held seven very successful phosphorus nutrition workshops in central and northern Queensland. Following the positive feedback from producers keen to access and use the new information, the DAF team have now made all of the workshop tools and resources available online on the FutureBeef website. Phosphorus (P) nutrition is critical to the performance and profitability of the northern Australian beef herd. Recent economic analysis led by Dr Maree Bowen as part of a Drought and Climate Adaptation Program project, has shown that management of P nutrition on deficient country is a very profitable option for central Queensland graziers. Other new studies conducted by the University of Queensland and Northern Territory Department of Primary Industries and Resources have improved the understanding of the impact of P deficiency on the productivity of breeder cows and growing cattle. All of this new data was first presented at two sold-out seminar audiences at Beef Australia in May (over 340 attendees) and then to over 300 viewers on the Beef Connect webinar series that aired in September. 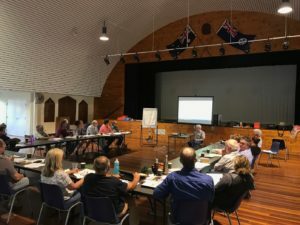 Continuing to extend the new research findings, the Fitzroy DAF beef extension team held a series of workshops for the P deficient coastal country in central Queensland in October 2018. The aim of the workshops was to assist beef producers to compose a P management plan that enables cost-effective supplementation of P on P deficient country. “We know that good management of phosphorus nutrition leads to substantial production and profit benefits, but producers still need help putting together a plan for their individual properties. We designed workshops with practical activities so graziers could start to flesh out a management strategy that they could action as soon as they got home,” said DAF Beef Extension Officer, Kylie Hopkins. Four workshops were delivered at Miriam Vale, The Caves, St Lawrence and Mackay in early October. The workshops were at full capacity with 103 people from 81 businesses in attendance. The producers in this group collectively manage over 2.9 million hectares and over 459 00 head of cattle in Queensland. The highest attendance was recorded at the Mackay workshop (38 participants), which featured on the Mackay WIN news. “The workshops received great feedback from producers and it makes our job really rewarding knowing that we have made a difference in someone’s business,” Kylie said. Workshop participants learned how to identify P deficient land types and assess the P status of different classes of cattle. A large proportion of the workshop also discussed the impact P deficiency has on the productivity of breeding and growing cattle, how to cost effectively supplement with P and how to manage grazing pressure and ground cover when cattle have adequate P.
The expert industry presenters Mick Sullivan (DAF), Rob Dixon (UQ) and Kylie Hopkins (DAF) provided several new resources, templates and tools to assist in communicating these key messages and to help producers manage P nutrition at the on-farm level. 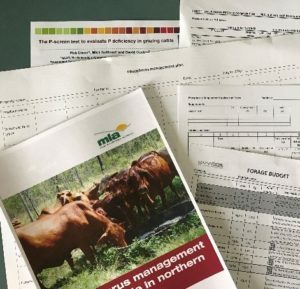 The great news is that the new phosphorus page on the FutureBeef website now includes all of the updated information, resources, templates (Phosphorus management plan, Word document, 14 KB or printable Lick intake calculator, PDF, 200 KB) and tools (Lick intake calculator, Excel spreadsheet, 1 MB) that were presented in the workshop. The workshops in central Queensland were so successful that they were repeated at three more locations in the Burdekin region a few weeks later, which had another 42 attendees. If you would like assistance with a Phosphorus management plan for your property, contact your local FutureBeef extension officer.